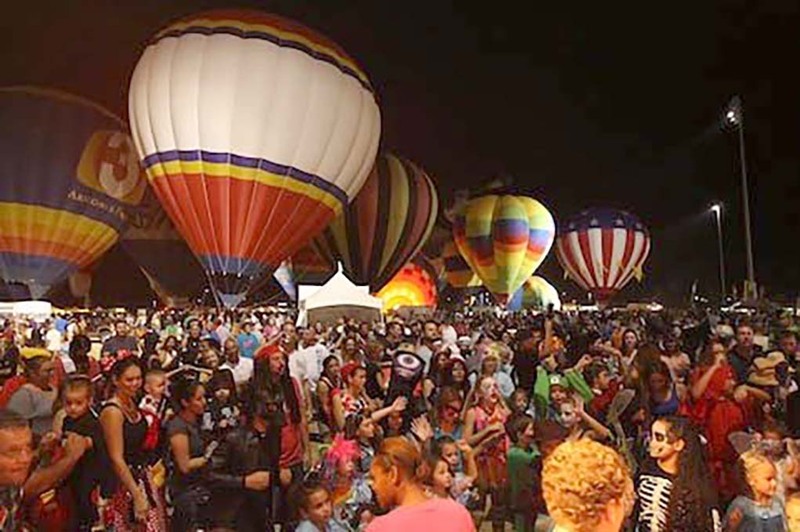 The 7th annual Balloon Spooktacular returns to Salt River Fields at Talking Stick in Scottsdale. This spectacular event is sure to light up the Valley skies with glowing hot air balloons, nightly firework shows and entertainment. The family friendly event is hosted nightly from 5:00-9:30 pm. And is perfect way to jump start the Halloween festivities. The annual event features more than 20 magnificent hot air balloons illuminating the sky as they participate in the world’s longest continuous glow at over 3 hours. The event will feature tethered balloon rides and balloon candy stations serving more than 4,000 pounds of candy to kids. This year’s event will feature new balloon shapes including Keystone Willy and Con Air. The 7th annual Balloon Spooktacular also feature a safe and fun trick-or-treat experience for all families and will include a nightly Costume Contests for kids, adults and groups. The Spooktacular Marketplace will allow attendees the opportunity to shop for arts, crafts and merchandise from on-site vendors. The Balloon Spooktacular will feature delicious food, drinks and desserts from 25 top local vendors, such as Honey Bear’s BBQ, Grandma’s Navajo Fry Bread, 5 & Diner, Desert Sno and more. In addition, McDelivery via UberEats will be handing out special surprises throughout the event. Enjoy live music, a pumpkin patch photo area and a free KidsZone which will feature 40 games and attractions including inflatable bounce houses, slides and an obstacle course. If you dare, stroll the Spook Trail, which will be manned by local high school students and feature surprises around every corner. Tickets to 7th annual Balloon Spooktacular are $15 for adults; $10 for children 3-12 and kids 2 & under are free. Some attractions require additional purchase at venue. You can purchase your tickets at http://www.srfballoonfestivals.com. When: Friday, October 27 & Saturday, October 28 from 5 – 9:30 pm nightly. Nightly fireworks show at 9pm.